After our visit to Rai Rai Ken, I brought Marcus to DessertTruck, which was located on Third Avenue between 8th Street/St. Mark's Place and 9th Street that night (I was in the middle of checking DT's Twitter tweets regarding that night's location when I saw it right in front of us). 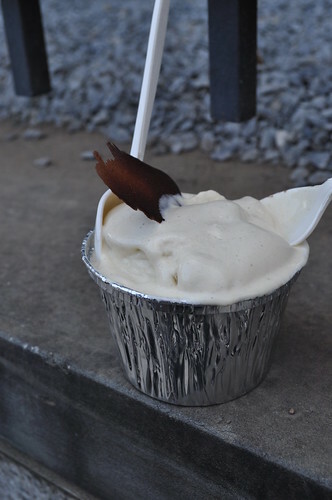 Jerome Chang, a former pastry chef at Le Cirque, started this dessert food truck (hence the name, DessertTruck, haha) back in October 2007 and has been creating atypical "ice cream truck" treats ever since. Photo of the truck itself! I took a photo of the menu offered that night, plus there was a Bobby Flay Throwdown stick/badge as well! I would've loved to have seen that episode to see what he came up with to compete with Mr. Chang's desserts! During my first visit [unblogged] to the DessertTruck with my best friend, Erin, I ordered the vanilla crème brûlee because when else would I have been able to order a fancy-shmancy French dessert, that requires a special torch no less, from a food truck?! That same night, Erin got the goat cheese cheesecake. We both aren't very fond of goat cheese, but the truck attendant that night highly recommended it, so we gave in. 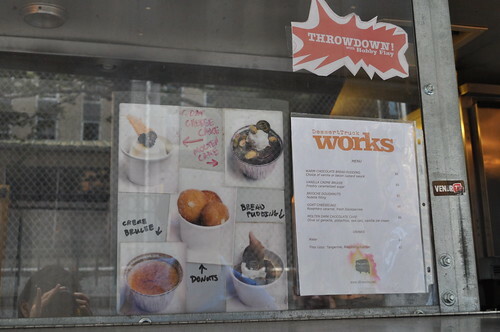 For desserts created inside a food truck, it was done very well! 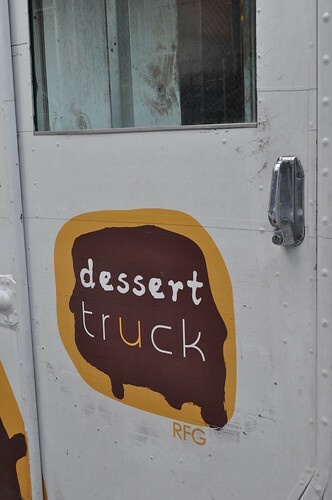 If I was blindfolded and given something to taste from DessertTruck, you wouldn't be able to tell it wasn't made in a fully decked-out kitchen. Marcus and I first decided on the molten dark chocolate cake, an olive oil ganache with pistachios, sea salt, and vanilla ice cream. The truck attendant that night told us that it wouldn't be ready for another 15 minutes, so we decided to wait. It was definitely worth the wait: with vanilla ice cream on top, the cake underneath, filled with dark chocolate ganache and bits of sea salt spread throughout, what isn't there to like? It was very chocolate-y (as implied by the "molten chocolate" in the title), and the sea salt gave a certain kick to it, which made it different than the typical molten chocolate cakes or brownie sundaes you would find on a Houlihan's or Applebee's menu. Highly recommended! 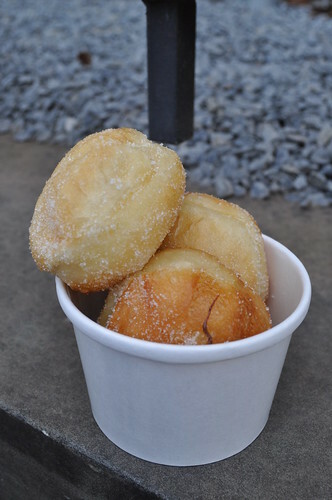 We also decided to order the brioche doughnuts with Nutella filling. And yes, it was as scrumptious as it sounds! I would say these doughnuts were very similar (if not exactly) to the beignets found in New Orleans, especially the ones served at Café du Monde in the French Quarter. I made a brief visit to New Orleans for an inter-chapter conference I attended for a college organization in which I was highly involved, so I made sure to make a stop at Café du Monde before I headed back to New York. Unfortunately, I don't have any photographic evidence, but my stomach can testify they were as yummy as all the hype makes them out to be! But back to the dessert at hand--it was just the right amount of dough-iness and sugar-i-ness as well as with the right amount of Nutella placed in the middle. Mmm. 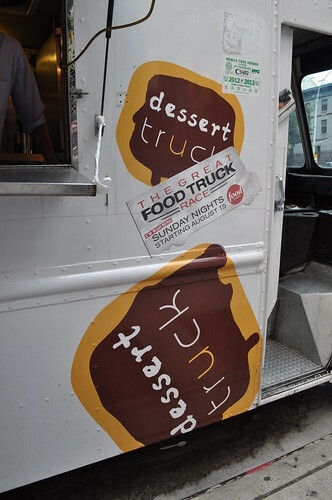 Findings: The DessertTruck is the perfect place to find a pretty good gourmet dessert after a quick bite at St. Mark's as well as a lovely place to bring a first date! None of the four desserts I've had there have been disappointing, so it's definitely a safe bet! Desserts in NYC (e.g., Pinkberry, Tasti D-Lite, Good Humor ice cream trucks) run about the same amount as the cost of one dessert here (see below), so you're almost paying the same for a high-caliber dessert at DessertTruck! Price point: Desserts at $6 each. *open Wednesday through Sunday, 6-11pm; check Twitter updates for specific location.